11/10/18 - Amazing time in Buffalo NY at the WNY Children’s Book Expo. So many wonderful people. We shared books, conversations, art, food, and friendship. Special thanks to schools: BPS 18 and BPS 76, and all the students, teachers, and librarians who made such a welcoming visit. 11/2/18 - Sneak Peek: I was honored to contribute art & info for a wonderful compilation book titled: WE ARE THE CHANGE: Words of Inspiration from Civil Rights Leaders, coming this spring 2019 on Chronicle Books. The book consists of sixteen award winning children’s book artists, each illustrating a select civil rights based quote that inspires them. 10/19/18 - This Sat. Oct. 20th in NYC I will be participating at BOOKFEST at Bank Street 2018. It's a great event with top children's book authors & illustrators discussing their work and publishing. My panel is titled: Bringing the Real World to Life! Illustration in Informational Books (1:45p–2:35p) See you there! 10/11/18 - BIG Thank you to Jonathan Masiulionis at Empowered Publicity for having me speak about my art, background, and NEW picture book: Hey, Wall: A Story of Art and Community on their Children's Book Spotlight Series. Enjoy the journey! 10/5/18 - Looking forward to speaking with Jonathan Masiulionis at Empowered Publicity as part of their wonderful Children's Authors Spotlight Series. 9/30/18 - Cool reviews on TeacherDance, Colorado Parent, and Kids Book A Day for my NEW book: Hey, Wall! A Story of Art and Community, with author Susan Verde. 9/28/18 - On the road again!...this time headed to upstate NY for the 6th Annual Chappaqua Children's Book Festival, taking place this Saturday, Sept 29th, from 10a-4p. I will be signing books along with 95 other authors and illustrators. Plus there will be lots of family/kids activities. So stop by and say hello with conversations. 9/27/18 - Proud to see my: Delicioso: Forever Stamps, created for the U.S. Post Office, selected for the AI-AP/ Latin American Ilustración 7 Annual. See all of this year’s winners HERE! 9/22/18 - New Jersey this Saturday, Sept 22nd, I will be signing books at the Princeton Children’s Book Festival from 11a-4p, in the Red Tent. The festival has an impressive list of 80+ authors & illustrators with fun & books for all. See: Librarian Leaps pics! NEW from Dreamscape: Frida Kahlo and Her Animalitos, available as a KidsVid and/or Audiobook! This beautifully illustrated video narrated by Adriana Sananes teaches kids about Frida Kahlo's art and the animals who inspired her. 9/4/18 - IT’S HERE! Happy Book Birthday to: Hey, Wall: A Story of Art and Community. 8/10/18 - Thank you Mrs. Knott's Book Nook for including a preview shout out for: Hey, Wall: A Story of Art and Community. 8/1/18 - So excited for the world premiere book trailer for: HEY, WALL: A Story of Art and Community, with author Susan Verde on the amazing Mr. Schu Reads blog. Bonus interview as well, So check it out! 7/13/18 - Big thank you to Publisher's Weekly for the wonderful and 1st print review for my upcoming illustrated picture book, Hey, Wall: A Story of Art and Community, with author Susan Verde, coming this September 2018. 7/12/18 - How amazing is this hotel: Casa Hermanas Bodrum, based on the work of Frida Kahlo and everything artistic, located on the beautiful shores of the Aegean Sea in Turkey. They also include an all ages, art workshop, based on my illustrated picture book with author Monica Brown: Frida Kahlo and Her Animalitos! 7/11/18 - I had great fun recording three audio book features for TeachingBooks.net. Each short feature speaks about the creation of the book and my art process. The site also has many wonderful audio book profiles that serve as an educational resource for educators & students. Click here to listen: 1. Frida Kahlo and Her Animalitos, 2. Gracias/Thanks, 3. Marvelous Cornelius. 6/28/18 - Fun to see me and my little reader making bee sounds (Bzzzzzzz) as I sign and doodle in: Frida Kahlo and Her Animalitos, at the Gaithersburg Book Festival. Read all about it in Publisher’s Weekly: In Brief: June 20, 2018. 6/17/18 - Come join us for The 2018 Pura Belpré Awards Celebración held Sunday, June 24th, from 1-3:30p, at the Hilton Riverside in New Orleans, at this year’s ALA Annual Conference. This free and open event will feature acceptance speeches by winners and honorees, musical performances, and book signing. 5/29/18 - Thank you to JEOPARDY! for featuring: Frida Kahlo and Her Animalitos & art as a SHOW CLUE in the category: Award Winning Children’s Books. Super Cool! 5/25/18 - Great to see Frida Kahlo and Her Animalitos listed as a Bank Street: Best Children's Book of the Year selection and on Américas Award: Children's and Young Adult Literature, Commended Title. 4/20/18 - Read all about last week's "Telling Lives" event in Publisher’s Weekly: Life Stories: A Celebration of the Picture Book Biography at NYU. 4/13/18 - Happy to be participating for NYU’s Steinhardt School of Culture, Education, and Human Development at NYU for “Telling Lives,” a Symposium Exploring Picture Book Biography, from 9:30 a.m. to 1 p.m. at Iris & B. Gerald Cantor Film Center in NYC. Picture book biography is among children’s book publishing’s most rapidly growing genres. This event brings together children’s literature historians & content creators to discuss trends and challenges. With panels that include: Selina Alko, Sean Qualls, Neal Porter, Sandra Jordan, Jan Greenberg, Robert Andrew Parker, Jennifer Browne, Christy Ottaviano, & Luann Toth. 4/7/18 - Thrilled to be at the 2018 Kweli: Color of Children's Literature Conference, today in NYC! I will be participating in 2 picture book panels and a portfolio review alongside many other wonderful authors, illustrators, editors, agents and more. So make sure you’re registered and I look forward to seeing you there. 3/30/18 - Watched Jeopardy! when the category of USPS Stamps comes up. Q: Latin American Cuisine on the Delicioso stamp series includes this 4-Letter egg custard. A: What is FLAN? How cool is it to have your art mentioned as a Jeopardy clue. 3/28/18 - A BIG THANK YOU! (youtube video) to the Association for Library Service to Children (ALSC), and to (REFORMA), The National Association to Promote Library and Information Services to Latinos and the Spanish-Speaking, for selecting, Frida Kahlo and Her Animalitos, as a 2018 Pura Belpré Honor Book for Illustration. 3/16/18 - Thank you to The Horn Book for their amazing nonfiction review of the week for: Frida Kahlo and Her Animalitos. 3/10/18 - Frida Kahlo and Her Animalitos on the Italian site Il Libraio. Grazie! 3/8/18 - In celebration of Women's History Month, many thank yous to the following sites for including: Frida Kahlo and Her Animalitos, on their respected lists of amazing women's children book biographies, including: Medium.com, Bookriot.com, Wesh2.com, and AMightyGirl.com. Gracias! 2/23/18 - So happy to announce my upcoming illustration project: Little Libraries, Big Heroes, written by Miranda Paul, which tells the story of the Little Free Library organization from founder Todd Bol’s first installation to the creation of more that 50,000 mini-libraries around the world. Houghton Mifflin Harcourt Trade / Clarion Books. 2/12/18 - I am incredibly honored today to receive news that “Frida Kahlo and Her Animalitos” has received the Pura Belpré Illustration Honor from the American Library Association (ALA) and REFORMA. The Pura Belpré Awards, established in 1996, is presented annually to a Latino/Latina writer and illustrator whose work best portrays, affirms, and celebrates the Latino cultural experience in an outstanding work of literature for children and youth. Congratulations also to my fellow Belpré winners! 2/11/18 - Thank you to LisbonParisMadrid.com Blog for their lovely reflections on, Frida Kahlo and Her Animalitos, and Frida's amazing paintings. 1/25/18 - @LittleFreeLibrary's /Action Book Club celebrates: Everyday Heroes, recommended reading list. Including: Waiting for the Biblioburro. 1/24/18 - I’m proud to announce that I’ve joined the author booking agency The Author Village! The Author Village is a community of forward-thinking and award-winning children’s book authors and illustrators available for school visits, library visits, festivals, conferences, panels, workshops, and special events. 1/22/18 - Thank you to the wonderful Pat Mora for sharing, Frida Kahlo and Her Animalitos, on Bookjoy! 1/17/18 - Big thank you to Yorokobu magazine for their, Frida Kahlo and Her Animalitos, indepth interview & profile: El libro de los animalitos de Frida Kahlo que está arrasando. 1/3/18 - Lovely write up in BrainPickings: Frida Kahlo and Her Animalitos: An Illustrated Celebration of How the Pioneering Artist’s Love of Animals Shaped Her Character. A loving homage to the inner menagerie of a wild and wondrous spirit. 12/24/17 - Smithsonian Magazine selects their The Ten Best Children’s Books of 2017, includes Frida Kahlo and Her Animalitos. 12/21/17 - Remezcla: Best Books from Latin American & Latino Authors in 2017, Includes Frida Kahlo and Her Animalitos. 12/5/17 - Got a budding art lover? Great round up of children’s books that celebrate famous artists at Artsy.net including Frida Kahlo and Her Animalitos. 12/5/17 - A Christmas thank you to Betsy Bird at Fuse8 Productions for including Frida Kahlo and Her Animalitos on their 31 Days, 31 Lists: Day Eleven – 2017 Bilingual Children’s Books. 12/5/17 - New FRIDA designed t-shirts and more at my TeePublic/JohnParraArt store. Based on the illustrated characters from: Frida Kahlo and Her Animalitos. 12/4/17 - The Washington Post includes, Frida Kahlo and Her Animalitos, in their booklist on building strong kids in today's world. 12/2/17 - The Center for the Study of Multicultural Children's Literature includes: Frida Kahlo and Her Animalitos, on CSMCL Best Books of 2017. 11/21/17 - Frida Kahlo and Her Animalitos makes it home to La Casa Azul in Coyoacán, Mexico thanks to my brother & friends. 11/28/17 - More wonderful profile reviews for Frida Kahlo and Her Animalitos. The first is from Rene Colato Lainez at La Bloga, second is from Maria Ramos Chertok at Latinxs at Kid Lit and third from Anamaria Anderson at Books Together. Feeling thankful. 11/27/17 - Frida Kahlo and Her Animalitos selected to Barnes & Nobel: Best Books of the Year 2017! 11/18/17 - Thank You Politics and Prose Bookstore & An Open Book Foundation in Washington D.C. It was wonderful to share the story & art of Frida Kahlo and Her Animalitos with you and the amazing students, teachers, and audience members. 11/3/17 - Feeling extremely honored today. The New York Times/New York Public Library has awarded, Frida Kahlo and Her Animalitos, as one of the BEST ILLUSTRATED CHILDREN'S BOOKS OF 2017. This year's selections marks the 65th anniversary of the Award—and the first year of the Times’ partnership with the New York Public Library on the honor. Judged purely on artistic merit, recipients will be honored at an awards ceremony at the 42nd Street-New York Public Library later this month. Announced also on Melino, NYPL, Publisher's Weekly, and Mr Schu Reads. 10/18/17 - Excited to be participating this week at the 2017 Virginia Children’s Book Festival, hosted by Longwood University in Farmville, VA. This annual 3-day event brings together prominent children’s authors, illustrators, to foster the enjoyment of reading among Virginia’s youth. The festival is open the public. 10/17/17 - In collaboration with The Virginia Children’s Book Festival, I’m proud to share: Welcome! / ¡Bienvenidos! : The Art and Illustration of John Parra, at the Longwood Center for the Visual Arts. The show is the largest exhibition of my original artwork and illustration on display, with close to ONE HUNDRED selected pieces from my 20year career. The work includes art from my children’s books, illustration projects, and fine art paintings. This will be the final week for the exhibition finishing with a closing artist reception on Friday, Oct. 20th, from 6-8pm. Happy and looking forward to seeing each and everyone there. 10/13/17 - Over at ALL THE WONDERS, author Monica Brown and I had a blast speaking with Matthew Winner about our new picture book, Frida Kahlo and Her Animalitos. Listen to the podcast interview now. 10/13/17 - Thank you to HipLATINA for their profile: Frida Kahlo Life Comes Alive In This New Children's Book. 10/12/17 - From the Wisconsin Gazette: Frida Kahlo and Her Animalitos, The Story of a Painter and Her Pets, with author Monica Brown and illustrator John Parra profile. 10/10/17 - THANKS to Grits & Grace: Kid Lit and to The Reading Ninja for their profiles of: Frida Kahlo and Her Animalitos. 10/9/17 - 4 NEW John Parra Art T-Shirts celebrating Día de los Muertos / Day of the Dead, at TeePublic. 10/5/17 - Saturday, Oct. 7th, I will be participating at the Warwick Children’s Book Festival in upstate New York, from 11a-4p. The event will have over 50 prominent and beloved authors and illustrators of children’s books in a celebration of children’s literacy. Come for the books, activities, and conversations and stay for Warwick’s charming shops, galleries, restaurants, apple orchards, farm markets, and of course Albert Wisner Public Library, named Best Small Library in America 2016. 9/22/17 - I am heading out to the great state of Minnesota for the 2017 MN-SCBWI Annual Conference, taking place this weekend. I look forward to meeting all the attendees and staff at this wonderful event. I am honored to be presenting my artist journey and looking forward to conducting an illustration workshop with my group. Let the adventure begin! 9/17/17 - Don’t miss Sunday Storytime with John Parra, illustrator of the new children’s book: FRIDA KAHLO AND HER ANIMALITOS, by author Monica Brown. The fun will be happening this Sunday, Sept. 17th at POWERHOUSE on 8th bookstore, in Park Slope, in Brooklyn, NY, from 11:30am to 12:30pm. All ages welcome and hope to see you there. 9/5/17 - Happy book birthday to: FRIDA KAHLO AND HER ANIMALITOS, from the award winning team of author Monica Brown and illustrator John Parra. Available at bookstores and online now, with English and Spanish versions. 9/1/17 - Background info and inspirations in a NEW joint interview with author Monica Brown and me, about our upcoming book, Frida Kahlo and Her Animalitos. 8/26/17 - Welcome! / ¡Bienvenidos! : The Art and Illustration of John Parra, is now open at the Longwood Center for the Visual Arts. The show will run until Oct. 22nd. 8/25/17 - I’m proud to announce: Welcome! / ¡Bienvenidos! : The Art and Illustration of John Parra, opening this week at the Longwood Center for the Visual Arts in Virginia. The show will be the largest exhibition of my original artwork and illustration on display, with close to ONE HUNDRED selected pieces from my 20year career. The work includes art from my children’s books, illustration projects, and fine art paintings. There will be an opening reception on Friday, Aug. 25th, 5-8pm. The show will be on view from Aug.26th – Oct. 22nd. This exhibition is presented in collaboration with the 2017 Virginia Children’s Book Festival. 8/13/17 - Celebrating the Premier of Frida Kahlo and Her Animalitos BOOK TRAILER!!! : Presented by: Betsy Bird at Fuse#8 Productions. Thank you to Betsy Bird at Fuse#8 Productions for presenting, to Rascal Media for the awesome animation, to Bjørn Lynne for the fantastic music, and to author Moinca Brown and her always amazing words. 8/4/17 - Woo-hoo! My advanced copies of Frida Kahlo and Her Animalitos came in today. Feeling so grateful and thrilled. Look for them this Sept. Also: Frida Kahlo y Sus Animalitos is a Junior Library Guild selection. 6/14/17 - See this wonderful video recap of the USPS Delicioso Forever Stamp Ceremony this past spring at the National Hispanic Cultural Center in Alburquerque, NM. from CGTN America. 6/9/17 - Look for my article: Alumnus John Parra Cooks up a Mailable Feast for the USPS, in a fun interview on my recent Delicioso Forever Stamps with my alma mater, Art Center College of Design & DOT Magazine. 6/4/17 - Thank you to Betsy Bird at School Library Journal for including my upcoming book with author Monica Brown, Frida Kahlo and her Animalitos, in her recommended Query: Is 2017 a Stronger Than Usual Year for Children’s Nonfiction? 6/2/17 - Looking forward to participating in BookExpo America at the Jacob Javits Center in NYC this Friday June 2nd from 12:30-1:00. I will be on the panel: Indie Insight Selects Children’s – from five Independent Publishers, speaking about my new book, Frida Kahlo and her Animalitos, with author Monica Brown from North/South Publishing. 5/21/17 - Thank you to everyone at this year's NevAEYC conference in Las Vegas. I had an amazing time speaking and presenting workshops with incredible teachers, educators, and staff. 4/28/17 - This Sunday celebrate El Dia de Los Ninos / Children's Book Day, Illustrator visit at Uniondale Library in NY. I will will speak about how I became an artist, then teach an illustration workshop. Program starts at 2pm. 4/25/17 - Thank you to everyone who came out last week for the USPS DELCIOSO Forever Stamps, First-Day-of-Issue Event, in Albuquerque, NM. It was amazing! Here are many wonderful links to online articles celebrating the new stamps: NBC News, NY Daily News, Albuquerque Journal, Martha Stewart Living, Huffington Post, Telemundo, Remezcla, Vibe, Vivala, New York Times, Washington Post, Yahoo News, Palm Beach Post, San Antonio Express News, SCPR Los Angeles and many more. 4/20/17 - The United States Postal Service cordial invites you today to attend the DELICIOSO Forever Stamps, First-Day-of-Issue Dedication Ceremony. The event will start at 5:45pm at the National Hispanic Cultural Center in Albuquerque, NM. The celebration will be in conjunction with Salud y Sabor, a free evening of food, art, and entertainment aimed at providing families with an opportunity to connect around nutrition, cooking, healthy lifestyles, and culture. 4/7/17 - On April 20th the U.S. Postal Service will unveiled six new Forever Stamps titled: DELICIOSO. I had the honor to create the artwork for the collection, with images celebrating the influence of Central and South American, Mexican and Caribbean food cuisine. Each stamp showcases a bright and playful illustration of one of the following dishes: tamales, flan, sancocho, empanadas, chile relleno and ceviche. The event will take place at the National Hispanic Cultural Center in Albuquerque, NM. 1/24/17 - I had no idea….National Tortilla Chip Day! Thank you to Celebrate Picture Books for the info and review. 1/28/17 - The stage is set, the lights have dimmed, the curtain has dropped, and the AMAZING cast and crew are ready for, MARVELOUS CORNELIUS, today at Mill Mountain Theatre in Roanoke, Virginia. 1/26/17 - Happy to share the cover of my NEW children’s book, Frida Kahlo and Her Animalitos, with author Monica Brown! Based on the life of one of the world's most influential painters, Frida Kahlo, and the animals that inspired her art and life. 12/22/16 - A wonderful article in the Washington Post with profiles of local student writers and artists depicting their amazing stories and artwork created from our wonderful workshop: Viajes de Mi Vida — Journeys of My Life. Working with students from Park View High School in Virginia the group conceived, wrote and illustrated 15 children’s stories in English and Spanish that were book printed and donated to local libraries and to school children in El Salvador. 12/10/16 - Thank you to the Children’s Book Academy and Mondays with Mira for their in depth review and video profile on my book MARVELOUS CORNELIUS. The site has wonderful resources on learning about children’s book writing and illustrating. 12/10/16 - Thank you to the Unconventional Librarian for their 12 Books of #Diversity list including: MARVELOUS CORNELIUS. 12/7/16 - Waiting for the Biblioburro is listed on the NBC News, Holiday Gift Guide: Here's Some Great Latino Books for Kids, Teens. The list includes other outstanding books by Angela Dominguez, Monica Brown, Duncan Tonatiuh, Graciela Tiscareño-Sato, Rene Colato Lainez, Margarita Engle, Phillippe Diederich, and Meg Medina. 12/2/16 - Proud to have my book, Green is a Chile Pepper: A Book of Colors, as part of Chronicle Books Blog: We Need Diverse Books More Than Ever. 11/7/16 - Celebrating The Texas Library Association's Coloring Book launch, the newest initiative and fundraiser designed to support TLA’s Disaster Relief efforts. The coloring book features artwork from numerous award winning illustrators including: Joe Cepeda, Tomie DePaola, Carolyn Flores, Xavier Garza, Molly Idle, Yuyi Morales, Roxie Munro, John Parra, Dan Santat, Paul Zelinsky, among many others. Curated by Texas librarians, the coloring book will feature 42 pages of illustrator-sketched canvasses and fun that will appeal to all ages. The books are available for purchase HERE. 11/5/16 - Congratulations to Park View High School (Loudoun County, Virginia) and Loudon County Public Library!! Our innovative 'Journeys of My Life' project, in which the students wrote and illustrated bilingual children's books, just won the 2016 Achievement Award from National Association of Counties (NACo)!! The student writers and artists worked hard with such passion, diligence, creativity, and inspiration. What a wonderful and fitting honor for their work. Great job to all the staff, educators and public librarians involved in this project as well! Shout out to the Latino Americans: 500 Years of History grantors! 11/3/16 - Thank you to Ella Chattanooga for their sweet review of Gracias/Thanks book. A wonderful reminder on Thanksgiving. 11/2/16 - This Friday, Nov. 4, I will be presenting at the National Association for the Education of Young Children (NAEYC) conference in Los Angeles. This event is the premiere gathering in the early learning community and will bring educators and professionals from all across the country and around the world to participate in hundreds of well-planned workshops, seminars, and presentations on the latest research and information on early childhood development. The conference includes many prominent and beloved authors and illustrators of children’s books in a celebration of children’s literacy. With a call for learning and inspired passion for educating our youth I hope to see you there. Look for me signing at the Book Vine Booth. 11/2/16 - SCBWI-IL will auction John Parra's FRIDA during the week following Prairie Writer's and Illustrator's Day 2016 to raise funds for SCBWI-Illinois’ Diversity Initiatives. Gifted by the artist and inspired by his upcoming picture book, Frida and Her Animalitos (written by Monica Brown, NorthSouth Books, 2017), we’re hoping that you will join us in promoting this auction. Participants can own this one-of-a-kind original while supporting diverse books and our members who create them! Visit the FRIDA Auction to see the painting and for more information on how to place a bid. 11/1/16 - Thank you to Southgate Elementary School in Albany, NY for a welcoming and supurb Artist Visit. We had presentations and student art workshops with amazing experiences and fun for all. I am forever grateful! 10/21/16 - Waiting for the Biblioburro now has a Spanish-English bilingual edition, available this Nov. 1st. You can order the new bilingual version: Waiting for the Biblioburro/Esperando el Biblioburro here. Also Thank You's go out to ELLA Chattanooga for their wonderful and whimsical Biblioburro review. 10/13/16 - Presenting at Parsons School of Design in NYC this Monday, Oct 17th, from 1:30-2:30pm. I will be sharing my artwork, background, and experiences for the children's book illustration class (Rm. 508) with the wonderful Pat Cummings. 9/23/16 - This week the United States Postal Service unveiled a select group of their upcoming 2017 postage stamps. I had the honor to create six Forever Stamps in a collection titled: Delicioso, with images celebrating the influence of Central and South American, Mexican and Caribbean food cuisine. Each stamp showcases a bright and playful illustration of one of the following dishes: tamales, flan, sancocho, empanadas, chile relleno and ceviche. 9/22/16 - Saturday, Oct. 8th, I will be participating at the Warwick Children’s Book Festival in upstate New York, from 11a-4p. The event will have over 50 prominent and beloved authors and illustrators of children’s books in a celebration of children’s literacy. Come for the books, activities, and conversations and stay for Warwick’s charming shops, galleries, restaurants, apple orchards, farm markets, and of course Albert Wisner Public Library, named Best Small Library in America 2016. 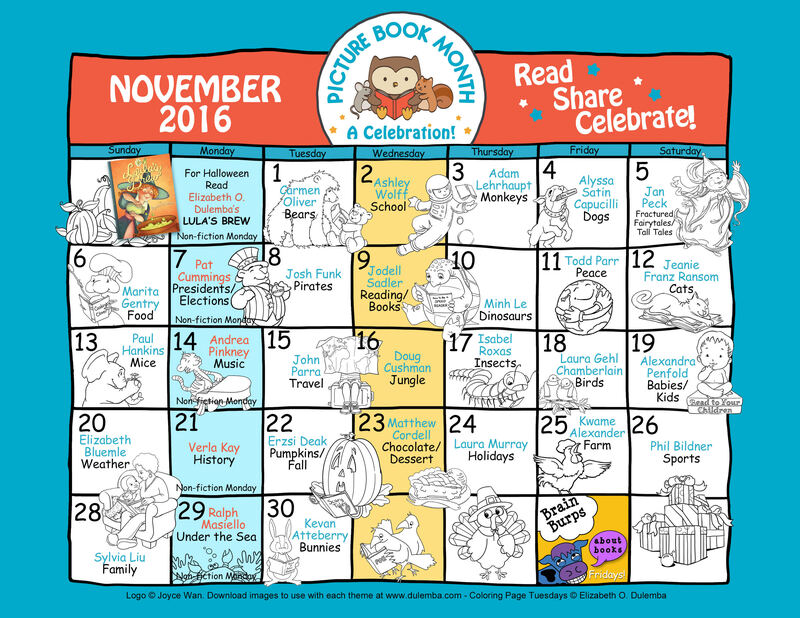 9/21/16 - November Picture Book Month Champions coming soon! Check the schedule for your favorite authors and illustrators. 9/10/16 - Publisher’s Weekly: A Joyful Diversity Collection: A great back-to-school list of wonderful books for kids on important and inspirational scientists, inventors, doctors, musicians, artists, poets, heroes, and many other individuals of diversity and color, including MARVELOUS CORNELIUS. 9/2/16 - Happy to hang out and answer questions with Lee Wind about The SCBWI Golden Kite Award-Winning Illustrations for "Marvelous Cornelius: Hurricane Katrina and the Spirit of New Orleans". 8/22/16 - Thankful to the Missouri Association of School Librarians for including MARVELOUS CORNELIUS as a 2017-2018 MASL Readers Awards Preliminary Nominee. 8/22/16 - WIN a copy of MARVELOUS CORNELIUS along with many other amazing and diverse picture books at the 2nd Annual Multicultural Children’s Book Giveaway sponsored by KidLit TV. Open to all parents, teachers, and librarians in need, for a chance to win a multicultural book bundle for their school library. 8/15/16 - See an introspecitve review of MARVELOUS CORNELIUS at @HomeLibrarian. In addition check out, Picture Books Making a Difference, at Knowledge Quest: Journal of the American Assocation of School Librarians. 8/12/16 - Two great profiles for my book MARVELOUS CORNELIUS. The first comes from bookseller Alia Jones from Blue Manatee in Cincinnati post on Publisher Weekly’s, ShelfTalker reading list: Black Books for Black Kids. Alia’s list also includes some great Full Circle Literary colleague authors and illustrators in the books Drum Dream Girl and Little Melba. The second review is from Dawn Young on the blog, PB Crazy, in the post, Picture Books that Inspire. 8/10/16 - Happy News: Publisher Weekly Rights Report announced Sylvie Frank at S&S/Paula Wiseman Books has bought world rights to a picture book biography of a little-known journalist by Lesa Cline-Ransome, with 2016 Golden Kite winner John Parra illustrating. Publication is slated for fall 2019. 8/4/16 - A fantastic profile review on the literary blog, Covered In Flour, of MARVELOUS CORNELIUS promoting Diverse KidLit. I'm also super grateful to be celebrating the one year anniversary in publication of MARVELOUS as it continues to receive such high reviews and responses. 8/1/16 - SCBWI Summer Conference Recap: photos 1, photos 2, and Speech. So many great literary panels, workshops, portfolio showcase, celebrations, connections, and events. A most incredible time with colleagues, family and friends. 7/29/16 - Over at The Urban Imagined blog there is a special profile of my book, Waiting for the Biblioburro, speaking about summer days, book readings, travel inspirations, cultural diversity and simple kindness. 7/24/16 - Going back to Cali for the SCBWI 45th Summer Conference taking place at the historic Millennium Biltmore Hotel in downtown Los Angeles this Fri. July 29th to Mon. August 1st to receive the Golden Kite Award in illustration for my children’s book MARVELOUS CORNELIUS. I look forward to also presenting an artist workshop/profile as well as participating in two author/illustrator panels. Hootie-Hoooo!!!!! 7/24/16 - Happy to be a part of The Texas Library Association’s Adult Coloring Book, the newest initiative and fundraiser designed to support TLA’s Disaster Relief efforts. The coloring book will feature artwork from numerous award winning illustrators including: Joe Cepeda, Tomie DePaola, Carolyn Flores, Xavier Garza, Molly Idle, Roxie Munro, John Parra, Dan Santat, Paul Zelinsky, among many others. Curated by Texas librarians, the coloring book will feature 42 pages of illustrator-sketched canvasses and fun that will appeal to all ages. Reserve to order your copy HERE. The books will be available for purchase in early November. You will NOT be disappointed in this amazing coloring book and wonderful fundraising effort. 7/23/16 - Thrilled to hear Hollins University in Roanoke, Virginia will present author Phil Bilder today with the inaugural Margaret Wise Brown Prize in Children's Literature for our book MARVELOUS CORNELIUS. 7/15/16 - I’m proud to have MARVELOUS CORNELIUS be included in the article, Trauma and Racism: Picture Books Open Hard Conversations, on the blog site Unpacking the POWER of Picture Books. 7/10/16 - Come hang out today, Sunday, July 10th, from 11am-4pm, at the Queens Museum Children’s Book Celebration! I along with other award winning book authors & illustrators will be reading and sharing our stories. In addition there will be children’s art making projects, a free exchange library (bring a book, take a book! ), and special literary obstacle course. 6/23/16 - Waiting for the Biblioburro listed on: 100 MUST-READ BOOKS ABOUT LIBRARIES & BOOKSTORES by Derek Attig. 6/5/16 - This Sunday, June 5th (12:30p-12:45p) I will be at the iconic 42nd Street Public Library (Schwarzman Building) in New York City to present for the Urban Librarians Unite annual 24 Hour Read In. This event has numerous authors reading for 15min each over the course of 24 hours. So stop by day or night to check out this somewhat strange yet wonderful hypnotic event. 6/4/16 - Super happy to see, Waiting for the Biblioburro, as part of the amazing and important work by Waterbridge Outreach whose vision is to give children in developing communities hope for the future through nourishing their minds and bodies with books and water. 6/4/16 - Thrilled to have my illustrations for my book MARVELOUS CORNELIUS receive a merit award from 3x3 Magazine No.13 Picture Book Show, alongside fellow great illustrators Carin Berger and Kelly Murphy. 6/3/16 - Congratulations to Jamie Campbell and Katie Scherrer for their NEW book, Once Upon a Cuento. This wonderful resource book is a professional manual for librarians on how to design and present bilingual storytime programs. 5/28/16 - Great to see MARVELOUS CORNELIUS listed in the Nerdy Book Club's article, 10 Books that Inspire Kids to Take Action and Change Their World. 5/23/16 - Thank you to all those that came out this past Saturday, in the rain no less, for the Gaithersburg Book Festival MD. In attendance we had more than 100 renowned authors and children’s book illustrators presenting their inspired work. Plus we enjoyed wonderful live music, writing workshops and food. A beautiful setting and event that is a must visit any year. 5/23/16 - Thank You to Gathering Books for including Waiting For the Biblioburro in their Celebrating Children’s Love for Books and Reading article. 5/13/16 - International Literacy Association includes MARVELOUS CORNELIUS in their Teachers' Choices 2016 Reading List. Since 1989, the ILA’s Teachers’ Choices project has identified outstanding trade books published in the last year that teachers themselves choose as being exceptional for curriculum use. Parents will also find the list invaluable, as it provides excellent choices for reading aloud or for help answering important questions prompted by children’s experiences as they grow up. 5/10/16 - Congratulations to all the student authors and illustrators of Park View High School, VA for their amazing work in creating and developing their own published children’s books. Their unique stories came from our workshop, Journeys of my life: Histories and Reflections /Viajes de mi vida: historias y reflexiones. 5/5/16 - I was happy to share a few thoughts with Lin Oliver and her Fantastic Frame series about one of my favorite paintings, "The Harvesters" by Pieter Bruegel the Elder. If you are in NYC you can see the original painting at the MET. 4/19/16 - Amazing News! The Inaugural Margaret Wise Brown Prize in Children's Literature goes to Phil Bildner for MARVELOUS CORNELIUS,” The annual award showcases the best picture book manuscript as selected by a panel of judges. 4/18/16 - Thanks to EVERYONE who came to the San Antonio Book Festival in Texas and the Truman State University Children’s Literature Festival in Missouri this month. They were amazing. A BIG shoutout goes to all the organizers & volunteers who worked incredibly hard putting these amazing events together. In addition I want to extend my supreme gratefulness to Woodlawn Academy, Madison Elementary, De Zavala Elementary, and Maverick Elementary schools in Texas for inviting me to present and share my story, art & illustration, and children’s books to all their students and staff. THANK YOU AGAIN! 4/18/16 - Thank you to Beth Anderson for a great review with parent/teacher activity ideas for MARVELOUS CORNELIUS. 4/13/16 - Happy National Bookmobile Day! Thank you to Lu and Bean Read for another great literary review. This one for my book, Waiting for the Biblioburro. 4/7/16 - Full Circle Literary Agency recap of MARVELOUS CORNELIUS 2016 SCBWI's Golden Kite win. 4/6/16 - From Lu and Bean Read Blog a special and thoughtful review of MARVELOUS CORNELIUS. 4/1/16 - Howdy/Hola Texas literary fans and YA/children’s book aficionados. Welcome and join me this Saturday for the 4th Annual San Antonio Book Festival taking place April 2nd from 10am to 5pm.The festivities will be held in downtown San Antonio,TX at the Central Library and neighboring Southwest School of Art. In attendance there will be more than 90 renowned authors and children’s book illustrators from around the country sharing presentations & stories that are sure to delight, entertain, and inspire all listeners. So stop by to say hi and perhaps pick up some signed books at this FREE & OPEN EVENT. 3/15/16 - Announced today: MARVELOUS CORNELIUS has received the 2016 SCBWI Golden Kite Award for Illustration! The Golden Kite Awards are given annually to recognize excellence in children’s literature in the previous calendar year by an SCBWI member in four categories: Fiction, Nonfiction, Picture Book Text, and Picture Book Illustration. The awards ceremony will take place at SCBWI’s 45th Annual Conference on Writing and Illustrating for Children in Los Angeles, California, from July 29 – August 1, 2016. See SCBWI's Blog recap of all the wonderful books in this year's Golden Kite selections. 3/11/16 - Thrilled to see my children's book MARVELOUS CORNELIUS selected by The Bank Street Center for Children’s Literature to be included on their Best Children’s Books of the Year, 2016 Edition List. 3/3/16 - I had an outstanding time participating for the GROG blog with an artist interview conducted by Sherri Jones Rivers. 2/14/16 - The Chicago Sun-Times: Celebrate Black History in Pictures for Kids, with MARVELOUS CORNELIUS book review. *PressReader required for viewing. 2/14/16 - A Wonderful Review of MARVELOUS CORNELIUS in Today's USA TODAY! Kids' picture books celebrate black history. 2/12/16 - I will be attending SCBWI’s winter conference reception event at the NYC Hyatt Grand Central 6 to 8pm tonight! Hope to see you there. 2/10/16 - MARVELOUS CORNELIUS included on Barnes and Noble's article: Filled with Hope and Courage: 9 Picture Books for Black History Month. 2/9/16 - MARVELOUS CORNELIUS has been selected for the WSRA (Wisconsin State Reading Association) Picture This! list of picture books! The WSRA Children’s Literature Committee members read widely and evaluate the newest books published each year in order to recommend the most interesting and valuable books for educators and children to read. 2/9/16 - I'm super happy to announce I will be a part of this year’s San Antonio Texas Book Festival. With an amazing group of authors and illustrators such as: Meg Medina, Sonia Manzano, Angela Dominguez, John Parra, Don Tate, Adam Silvera, Xavier Garza, Monica Brown, Children's Author, Ire'ne Lara Silva, Pam Muñoz Ryan, Carmen Boullosa and many more! All happening Saturday April 2nd 2016, 10am-5pm. 2/2/16 - MARVELOUS CORNELIUS has been selected as a Notable Social Studies Trade Book for Young People by the CBC-NCSS! Hootie-Hoooo!! 2/1/16 - MARVELOUS CORNELIUS has been chosen for Chronicle Eye Candy e-book promotion for February. For the entire month the e-book of MARVELOUS CORNELIUS will be available for only $1.99 across a variety of e-book retailers. 2/1/16 - MARVELOUS CORNELIUS has made the New York Public Library's historic: African-American Experience Children’s Literary Reference Guide (2011-2016) for picture books. 1/29/16 - From All the Wonders: 12 Delightful Picture Books with Diverse Characters including MARVELOUS CORNELIUS. 1/28/16 - Thank you to Sherri Jones Rivers at the Grog Blog for her insightful MARVELOUS CORNELIUS deconstruction. 1/27/16 - Today is Multicultural Children’s Book Day—the brainchild of Jump Into a Book‘s Valarie Budayr and Pragmatic Mom‘s Mia Wenjen. Look for MARVELOUS CORNELIUS on the Chronicle Books Blog: Celebrating Diversity in Chidlren's Books with Lovely Illustrations. 1/24/16 - Look for MARVELOUS CORNELIUS as part of Kids Travel Books site: Children’s Books about New Orleans. 1/23/16 - Thrilled to be working again with author Monica Brown for our 3rd book as reported in PW, Frida and her Animalitos! 1/22/16 - Sneak peak at the cover for Once Upon a Cuento: Bilingual Storytimes in English and Spanish by Jamie Campbell Naidoo and Katie Scherrer. The cover art comes from another of my children’s books: Green is a Chile Pepper. This new book will be available from ALA Editions in May. 1/12/16 - Folk Tales and Facts: Marvelous Cornelius (One that got away) from: Unpacking the POWER of Picture Books. 12/27/15 - Hootie-Hoooo!! MARVELOUS CORNELIUS Won a 2015 Nerdie for Non-Fiction Picture Books! So Thrilled to Be Included on This List! 12/18/15 - School visit today with the students of PS-32, in Brooklyn, NY! We will be reading and sharing my children’s books along with my art and background stories. 12/12/15 - I had an unbelievably good time on StoryMakers with Rocco Staino discussing my new children’s book MARVELOUS CORNELIUS. Additionally there is info about a three (3), John Parra: Book Bundle Giveaway, from KidLit TV. Each bundle contains a signed copy of Marvelous Cornelius: Hurricane Katrina and the Spirit of New Orleans, Green is a Chile Pepper: A Book of Colors, and Round is a Tortilla: A Book of Shapes. So cool, it's impossible to resist! 12/12/15 - Today in NYC, from 3 to 5pm, I will be reading and signing my children’s books at The Princeton Club of New York for all members and their friends and family. They will also be hosting additional best-selling guest authors including children's books author Roxie Munro, Melanie Hope Greenberg, Fran Manushkin and more!Stop by for some hot chocolate and good books. 12/11/15 - School visit next Friday with the students of PS-32, in Brooklyn, NY! We will be reading and sharing my children’s books along with my art and background stories. 12/9/15 - MARVELOUS CORNELIUS is a 2015 Nerdy Book Club Award! Thank You to Colby Sharp for the Nomination. 12/2/15 - Thank you to, Read it Real Good, with their excellent profile on my children's book, MARVELOUS CORNELIUS. 11/20/15 - MAVRELOUS CORNELIUS has received the Parents' Choice “Gold” Award for Picture Books Fall 2015. 11/20/15 - Thank you Park View High School and Library for an amazing school visit in Loudoun County, VA! Can’t wait to return to see your published books! Review in the Viva Loudoun Press. 11/15/15 - The 1ª MACLI: Mostra de Arte Contemporânea em Literatura Infantil, group art show continues at Centro Cultural Sesc Glória, Vitória, Brazil. 11/15/15 - I am grateful to Vamos a Leer's articles: En la Clase: Gratitude, Awareness, and Poetry for the Classroom, and Gracias-Thanks, for their profile of my books: Green is a Chile Pepper, Round is a Tortilla, and Gracias/Thanks, encouraging students to share positive ideas for activities on gratefulness, gratitude, and/or awareness during this Fall season. 11/12/15 - Children’s Literacy Initiative: Closing the Diversity Gap in Children’s Books article includes MARVELOUS CORNELIUS as a featured picture book selection that showcases diverse and quality multicultural themes for all readers. 11/11/15 - Brightly’s: 26 Picture Books You Won’t Want to Miss This Fall, includes MARVELOUS CORNELIUS. Hootie Hooo! 11/10/15 - Publishers Weekly has a wonderful recap from our recent panel discsussion in Washington DC at Politics and Prose Bookstore: Picture Books for Older Readers. 11/7/15 - Sunday Nov. 8th at Politics and Prose Bookstore in Washington DC I will be participating in the Third Annual Picture Book Panel: Too Good to Miss - Picture Books for Older Readers. Our panel will include award winning authors and illustrators: Jason Chin, Christopher Myers, Nancy Paulsen, Chris Soentpiet, Jacqueline Woodson, and myself. Event Video Here! 11/5/15 - Pround to see my illustration: Hearing the Cry of the Poor: The Jesuit Martyrs of El Salvador, for Santa Clara Magazine, has been included in the Latin American Illustration 4 Annual. 11/4/15 - This month The Nonfiction Nook is spotlighting Marvelous Cornelius with article links and a BOOK GIVEAWAY! 10/30/15 - Sharing my favorite cuppa of choice with hotTEAs of Children’s Literature: Café Bustelo, a Cuban/Puerto Rican-Style coffee, brewed and cloth strained old fashion style mixed with milk and Solgar sweetener to kick start any day. 10/29/15 - I’m happy to be heading to the NY Society of Illustrators tonight for the children’s book Original Art Show. The annual exhibit will be on display from October 28 through December 23, 2015. Hope to see you among the crowd. 10/26/15 - Publishers Weekly has announced my next children's book HEY WALL, written by Susan Verde, about a boy who brings his community together to create a mural in a celebration of urban art. Published by Paula Wiseman an imprint of Simon & Schuster with amazing editor Sylvie Frank! 10/21/15 - Three more profile reviews of MARVELOUS CORNELIUS at: Kiss the Book, Mother Daughter Book Club and the wonderful Annette Bay Pimentel. 10/20/15 - I recently had the pleasure to contribute to the academic journal article Celebrating the Americas through Picturebooks, written by Dr. Anne Dolan, a lecturer in primary geography at Mary Immaculate College at the University of Limerick in Ireland. Dr. Dolan highlights the possibilities of using children’s picturebooks, such as Waiting for the Biblioburro and My Name is Gabriela, to be used as part of a geography curriculum for teaching about Central and South American culture and inspiring a range of work in the classroom. You can find the journal listed on the site: Geographical Association. Also look for Anne’s book: You, Me and Diversity Picturebooks for teaching development and intercultural education. 10/10/15 - American Libraries Magazine announced The Pura Belpré Award will celebrate it's 20th Year with a Commemorative book and ceremony planned for 2016 ALA Annual Conference. 10/10/15 - MARVELOUS CORNELIUS is named a Junior Library Guild Selection. Hootie-Hoooo!!! 10/10/15 - Celebrating Cornelius! The All-Week MARVELOUS CORNELIUS Blog Party with Author Phil Bildner, Illustrator John Parra, Literary Agent Erin Murphy, Chronicle Book Editor Melissa Manlove, Chronicle Book Senior Designer Ryan Hayes, and School Librarian/Educator Angie Arnett and her 4th Grade Class. Presented marvelously on Dionna's, Color Me a Kidlit Writer. 9/28/15 - Thrilled to be hanging out with Rocco Staino at KidLit.tv for an interview on my artwrok and new book MARVELOUS CORNELIUS. More details to come. 9/23/15 - A Modern Day Folktale: MARVELOUS CORNELIUS Blog Post by author Phil Bildner. 9/18/15 - This Sat., Sept. 19th, I will be participating in the Princeton Children’s Book Festival in New Jersey 11am - 4pm. There will be book signings and presentations with many other amazing and award winning authors and illustrators. This is a free, rain-or-shine event that offers numerous fun & additional activities throughout the afternoon. I look forward to seeing you there. 9/4/15 - MARVELOUS CORNELIUS is part of Imagination Soup's: 8 Stellar Picture Book Biographies as well as Sal's Fiction Addiction literary blog. 8/22/15 - From the Full Circle Literary blog: MARVELOUS CORNELIUS: Hurricane Katrina and the Spirit of New Orleans, debuts on Katrina Anniversary. 8/20/15 - I am honored by the New York Society of Illustrators who have selected my artwork in Marvelous Cornelius to be included in their annual Original Art Show to be exhibited this Fall in NYC. 8/18/15 - Read about MARVELOUS CORNELIUS book origins in Phil Bildner's blog post about the trips he and his students took to aid in the rebuilding of New Orleans. Phil will also be in New Orleans at the end of the month to mark the 10 year anniversary with a visit and book signing at Octavia Books. 8/15/15 - NEW profile reviews for my book, MARVELOUS CORNELIUS, from Notes on New Orleans .net, The Miami Times, PBG Lifestyle Magazine, Kid Lit Reviews, The Post News Group, Flowering Minds, The News Star, Unadulterated.us, The Advertiser, Louisiana Book News, Imagination Soup, and the Star Tribune. 8/6/15 - Listen to Let's Get Busy podcast: with Phil Bildner and John Parra, author and illustrator of MARVELOUS CORNELIUS: Hurricane Katrina and the Spirit of New Orleans, published by Chronicle Books, stop by to talk about the 10th anniversary of the worst man-made disaster in New Orleans' history, conducting visual research, and toxic gumbo. 8/5/15 - The New Orleans Times Picayune published an amazing feature on Cornelius Washington, Hurricane Katrina, and MARVELOUS CORNELIUS! 8/5/15 - MARVELOUS CORNELIUS receives a Starred Review from Shelf Awarenes! 8/4/15 - Happy book birthday to MARVELOUS CORNELIUS: Hurricane Katrina and the Spirit of New Orleans! May you enjoy the words, paintings, and spirit of its story. 8/3/15 - Thank you to Kirkus for their wonderful review of new book, MARVELOUS CORNELIUS. Also see check out Books and WhatNot awesome review for the book. 8/3/15 - MARVELOUS CORNELIUS has been selected by the Amazon editorial team as a Best Book of the Month (August, Ages 6-8 category). 7/10/15 - Grateful to all the 4th graders from Swenke Elementary who made the book trailer for my new children's book, MARVELOUS CORNELIUS: Hurricane Katrina and the Spirit of New Orleans. Due out Aug. 4th. 7/5/15 - Hip Latina has a great article: Summer Reading, Latino Style! Explore 2015 Pura Belpré Award Winners with Your Kids. 6/25/15 - I'm heading out to San Francisco for the 2015 ALA Summer Conference, ALSC Pre-Conference, & Pura Belpré Celebration. There will be awesome discussion panels, book signings, speeches, & all around fun events. Hope to see you there! 5/16/15 - Registration is now open for my event: A Very Special Storytime with John Parra, at The Metropolitan Museum of Art in New York, Sat. June 13th, from 1 to 3pm with artist presentation, book signing, and kid's art workshop. 5/16/15 - This summer, invest in yourself by taking a class at La Casa Azul Bookstore! Wednesdays, July 8, 15, 22 from 6 to 8pm: Art Illustration and Promotion Workshop with John Parra. 5/15/15 - Thank you Full Circle Literary for a wonderful introduction in joining their amazing creative and literary agency family. 5/9/15 - I'm super excited to receive in the mail today an advanced copy of my newly illustrated children’s book: MARVELOUS CORNELIUS: Hurricane Katrina and the Spirit of New Orleans. Coming this August on Chronicle Books. 5/8/15 - Happy to see my book, Green is a Chile Pepper, in Chase Bank's: Mission Main St. Grants commercial. But don't blink, you might miss it. 5/7/15 - Green is a Chile Pepper on Chronicle's: Charming Books Blog. 4/2/15 - "A is for…Art in Activism" group art exhibition and book signing with artisti/illustrator John Parra, Saturday, May 2nd, 12:00pm - 1:30pm at La Casa Azul Bookstore in NYC, featuring artwork from the books "A is for Activist" by Innosanta Nagara and "When Thunder Comes" by J. Patrick Lewis. Both books honor activists who have left their mark on the world we live in. 4/23/15 - Join El Museo de Bario in celebrating UNESCO World Book Day! They will be reading from Waiting for the Biblioburro and sponsoring an art-making workshop to channel your inner creativity to make your own book cover. 4/2/15 - Save The Date: The Metropolitan Museum of Art in New York presents: A Very Special Storytime with John Parra. June 13th, from 1 to 3pm, with artist presentation, book signing, kid's art workshop and more. Registration will open in mid-May. 3/24/15 - The Journal Sentinel News in Milwaukee, WI, has a wonderful article titled: 11 new books for foodie kids (and their adults) that shares my book, Green is a Chile Pepper, with some hungry readers. 3/19/15 - Excited to say that my book Green is a Chile Pepper has made the Best Children’s Books of the Year (Under Five), 2015 Edition from the prestigious Bank Street College Center for Children’s Literature. 3/15/15 - Thank you to Pragmatic Mom Blog for including Green is a Chile Pepper, on their Top 10 Multicultural Board Books for Babies and Toddlers. 3/6/15 - Happy to be with such fine literary company as profiled on Chronicle Book's blog, ALA Midwinter Award's recap. 3/4/15 - Thank you to librarian Daniela Guardiola and the 2nd grade students at Delco Primary School in Austin, TX, for inviting me to their World Read Aloud Day Celebration to speak about my children’s books and artist background, via Skype. 2/27/15 - I had great fun recording a short audio feature on my book Green is a Chile Pepper for TeachingBooks.net. The site has many wonderful audio book profiles that serve as an educational resource for educators and students. You can listen to my link here: Meet-the-Author Book Reading. 2/21/15 - John Parra thank you video. Named 2015 Pura Belpré Illustrator Honoree by ALA and REFORMA. 2/2/15 - I am very excited to announce that my book “Green Is a Chile Pepper” has just received the Pura Belpré Illustration Honor from the American Library Association. I am immensely grateful and thankful to all the support from ALA and REFORMA. I also extend my congratulations to all the other amazing writers and illustrators who received recognition for their terrific work, especially a couple of my favorites: Yuyi Morales and Duncan Tonatiuh. 2/1/15 - I'm excited to share a few spreads from this year’s 3x3 Magazine of Contemporary Illustration: No.11 Picture Book Show Annual, with Silver Medal and Distinguished Merit awards pages. Click here to see more. 1/13/15 - I had great fun in a recent interview conducted by fellow author/illustrator Lila Weaver, over at Latin@s in Kid Lit. The article is chocked full of information regarding my art background, painting details and secret Easter egg images I include in my work. Enjoy! 12/22/14 - I am happy and grateful that my book, Green is a Chile Pepper, has been selected as one of the Best Multicultural Books of 2014 compiled by the Center for the Study of Multicultural Children’s Literature (CSMCL) and shared by The Association for Library Service to Children's (ALSC) Blog. 12/17/14 - School Library Journal has a great artlcle announcing NYPL’s 2014 100 Books for Reading Sharing List that includes artwork from my book Green is a Chile Pepper on the cover brochure. 12/17/14 - Thank you to the New York Public Library for including my children’s book Green is a Chile Pepper on their top 100 Titles for Reading and Sharing 2014 list. You can also see artwork from the book showcased on the cover of the PDF printed edition of their annual list. A second big thank you also goes to the Chicago Public Library for including my book on their Best Picture Books of 2014 selections as well. 12/16/14 - Thank you very much to all those that purchased my books Green is a Chile Pepper and Round is a Tortilla this year at La Casa Azul Bookstore in New York City to make it on their top best sellers list for kids. 12/11/14 - Lee & Low Books shared a great article, Choosing the World Our Students Read, by Emily Chiariello that includes art from my book Gracias/Thanks. 11/20/14 - View some of my original children's book art that was on display at this year's Exhibit of Contemporary Art in Children’s Literature, Centro Cultural Sesc Paraty, RJ Brazil. 11/15/14 - NBC News shared a great article, Latinas for Latino Lit: Remarkable' Children's Books of 2014, with my book Green is a Chile Pepper among the selected. 10/15/14 - Recently I had the privelge to Illustrate an article for Santa Clara University Magazine, titled: Hearing the Cry of the Poor, The Jesuit Martyrs of El Salvador. The editorial that I created the illustration for takes a detailed look and examines the powerful and moving events that lead to an historic turning point in Central America's El Salvadorian civil war. 8/15/14 - “To peel back the curtain and become a juror charged with reviewing this year’s submissions was a fantastic honor. To judge the quality, beauty, style, diversity, and boldness of these amazing works was no easy task.” Participating as a judge in this year’s NY Society of Illustrator’s: Original Art Show was an amazing experience. The show itself will feature the very best of children’s book art illustrations from the past year. The Opening Reception and Awards Ceremony will be held at the Society of Illustrators (128 East 63rd Street, NYC) this Thursday, October 23rd. at 6:00pm. For tickets click here. Hope to see you there. 8/15/14 - This Sunday, September 21st, I will be at the Brooklyn Book Festival signing books and participating in a "Draw Off" with fellow illustrator Kris Di Giacomo at the BKBF children's area (Columbus Area) as well as participating at the table of Las Comadres Para Las Americas and La Casa Azul Bookstore. The Festival is the largest free literary event in New York City, presenting an array of national and international literary stars and emerging authors. The events for this diverse gathering attracts thousands of book lovers of all ages to enjoy authors and the festival’s lively literary marketplace. Hope to see you there. 8/15/14 - I am super thrilled and honored to have received both a Silver Award for my book, Round is a Tortilla: A Book of Shapes, and a Distinguished Merit Award, for, When Thunder Comes: Poems for Civil Rights Leaders, from 3x3 Magazine of Contemporary Illustration to be included in their International Picture Book Show. All medal, merit and distinguished merit winners will appear in the 3x3 Illustration Annual No. 11 to be released in both a print and iPad edition this winter. 7/11/14 - It was a pleasure to speak with Robin Dobson on her online blog, The Nonfiction Nook, and discuss my new children’s book Green is a Chile Pepper. Robin is a talented, writer and educator from my hometown of Santa Barbara, CA. Be sure to check out her wonderful author site. Also remember to leave a post comment to qualify to win a signed copy of my new book. 7/8/14 - I see some wonderful & familiar faces in Publishers Weekly Photo-Essay from this year's ALA conference in Las Vegas. 7/2/14 - I'm excited to see my new book, Green is a Chile Pepper, included on ALSC's blog article, Eleven of the Best Preschool Picture Storytime Books of 2014 (so far). 6/29/14 - I'm super honored and proud that my children's books, Round is a Tortilla and Green is a Chile Pepper, took home Best Latino Focused & Educational Picture Books at part of this year's ALA, International Latino Book Awards. Other amazing winning authors included: Isabel Allende, Monica Brown, Meg Medina, and Rudolfo Anaya, as well as the late Mexican-American singer Jenni Rivera and current Supreme Court Jusitce Sonia Sotomayor. For a complete list of winners click here. 6/28/14 - The NBC news article, Growing Int'l Latino Book Awards Reflect Booming Market, wonderfully previews tonight's awards event at the Clark County Library in Las Vegas, as well as showcasing and celebrating the growing and expanding book market of Latino literature and culture. 6/27/14 - Hello Everyone! Well, I’m headed out west to the 2014 annual American Library Association (ALA) Conference in warm, sunny, and just plain hot, Las Vegas. If you happen to be at the LV Convention Center Saturday and Sunday I will be signing my books throughout. Feel free to stop and say hi. Also I will be at the International Latino Book Awards Saturday night at Clark County Library for more awards and festivities. May all those attending have a fantastic and memorable adventure. Cheers and happy travels! 6/6/14 - Watch my recent panel interview on this week's Sunday episode of Tiempo with Joe Torres, at WABC/Channel 7 Studios in New York, in support of #WeNeedDiverseBooks campaign. Click part 1 and part 2 to view. 6/5/14 - Great News! Round is a Tortilla is on the Best Children’s Books of the Year (under five), 2014 Edition list from the Bank Street College of Education Book Committee. In choosing books for the annual list, reviewers consider literary quality and excellence of presentation as well as the potential emotional impact of the books on young readers. Round is a Tortilla has also been nominated for the Round Rock Independent School District’s Armadillo Readers’ Choice Award. The Armadillo Readers’ Choice award is an annual Children’s Choice Award chosen by students of Round Rock ISD in Round Rock, Texas. The winning title will be announced in mid-May 2015. 5/10/14 - I am happy to say that my new children's book, Green is a Chile Pepper, received a STARRED Review from the School Library Journal (SLJ). You can also read New York Times Public Library Collections Specialist, Eizabeth Bird's preview here. 5/1/14 - Visit Chronicle Book's Blog: Colorful Crafting with Green is a Chile Pepper from Ms. Meghan Makes! Meghan Premo-Hopkins is an English teacher, mom of three, and super fan of Chronicle children’s books. She shares her inspired ideas for book-related activities every other month (or so). This month's activity is based around my new children's book, Green is a Chile Pepper. 4/27/14 - Round is a Tortilla, was selected with a Commended Title honor for this year's Américas Book Award. CLASP founded the Américas Award in 1993 to encourage and commend authors, illustrators and publishers who produce quality children’s and young adult books that portray Latin America, the Caribbean, or Latinos in the United States, and to provide teachers with recommendations for classroom use. 4/26/14 - Hi Everyone, today I will be reading and signing my children's books at the 4th Annual East Harlem Children's Book Festival located La Casa Azul Bookstore in NYC, from 11am to 4pm. There will be many favorite local authors and illustrators at this free event featuring storybooks, storytellers, book signings, music, art and dance! The festival is a celebration of children, families, community, and literacy.This is a free, rain-or-shine event that offers many additional fun activities throughout the day. 4/21/14 - I am honored to be included in this year's Communication Arts Magazine 55th Illustration Annual, with a full spread of my artwork from my children’s book, Round is a Tortilla, inside. (pgs: 124-125) Only 168 of 4,362 entries were selected, making the Illustration Annual one of the most exclusive illustration competitions in the world. 4/17/14 - I happy to be a featured author in a new series called “Cuentos… discovering the person behind the stories” on the wonderful blog site, Lucha Libros. Hope you check it out. 4/15/14 - In celebrating this years Día de los Niños, Día de los Libros, I am grateful again to be contributing an article for the Día Blog Hop, sponsored by Latinas for Latino Lit. The article can be view at ModernMami.com, an award-winning lifestyle blog covering parenting stories, Latino culture, and concerns of working mothers, with a focus on work-life balance. 3/24/14 - I am very honored and super excited to see both, Green is a Chile Pepper and Round is a Tortilla, listed as finalist for The 2014 International Latino Book Awards: Best Latino Focused Children’s Picture Book (English) & Best Educational Children’s Picture Book (English), produced by Latino Literacy Now, an organization co-founded by Edward James Olmos and Kirk Whisler, and co-presented by Las Comadres para las Americas and Reforma, the National Association to Promote Library and Information Services to Latinos. 2/18/14 - I am proud to announce my new children's book, Green is a Chile Pepper: A Book of Colors, is now available for purchase online and in stores. I will be signing and displaying original illustrations from my new book at La Casa Azul Bookstore in New York City on March 8th, for the Día de los Niños, Día de los Libros reading celebration. 2/1/14 - Thank you to The Good Long Road for including Round is a Tortilla on their 10 Best Multicultural Children's Books We Read in 2013. It also made one of the Best Sellers at La Casa Azul Bookstore, 2013. 1/25/14 - Round is a Tortilla has been selected to be a part of Reading is Fundamental's: 2013-14 Macy’s Multicultural Collection of Children’s Literature. My book is one of 40 titles that will be distributed by RIF to schools and other organizations across the country, with a focus on reaching at-risk and underserved children. 1/20/14 - Here is a cool review of my upcoming book, Green is a Chile Pepper, on the wonderfully creative design site Tinybop. Plus another great preview and profile in School Library Journal's column Libro por Libro. 1/15/14 - I am very grateful and honored to have two books, Round Is A Tortilla and When Thunder Comes, that I did artwork for, nominated for ALSC Notable recognitions. 1/15/14 - Round is a Tortilla, has been honored as a selection for this year’s Texas 2x2 Reading List presented by The Texas Library Association, established in 1902 to promote, support, and improve library services in Texas. 1/15/14 - Visit Amazon's NEW John Parra's Page with book list and upcoming calendar events. 1/15/14 - I’d like to share a wonderful review of, Round is a Tortilla, on La Bloga. Enjoy! 12/07/13 - Thank you to everyone who came out to Chemers Gallery in support of the The Annual Children's Book Illustration and Art show. in Tustin this weekend. It was truly an amazing day filled with wonderful conversations, intriguing art demos, fantastic art, beautiful children's books and of course lots of love from family, friends and new acquaintances. 11/20/13 - Save The Date - The 2013 Annual Children’s Book Illustration Art Show & Book Signing at Chemers Gallery in Tustin, CA, Dec. 7th, where I will be showcasing close to 40 of my original painted illustrations spanning across my children’s book catalogue. Included in the exhibition and book signing I will be presenting a painting demo for all in attendance. I look forward to seeing you there. For more to view check out: presale artwork, book orders , and event poster. 10/29/13 - This Saturday Nov 2nd, in NYC at Books of Wonder, starting at 4pm, I will be participating in the event, Inside Story, sponsored by SCBWI. I, along with other author/illustrators, will be sharing our process and stories behind our work as well as signing our most recent children's book. I look forward to seeing you there. 10/7/13 - On The Picture Book Lab blog, there is a cool article, Concept Picture Books: a much-needed multicultural spin, examining and discussing my recent children's book, Round is the Tortilla. 09/24/13 - I am most honored today to be a part of the amazing 7 Impossible Things for Breakfast, children’s book blog with Julie Danielson. This has to be the most detailed interview and art image post I've participated in. All presented with a multitude of Q&A's, new & old art illustrations, rare book sketches, and home studio photos. Please feel free to stop by and leave a comment. There are also volumes of other great artists and articles throughout 7-Imp’s impressive site to enjoy and read. 09/18/13 - I am honored to have my art, in continued participation, at the 1st Annual MACLI - Exhibit of Contemporary Art in Children's Literature exhibit now up at CAIXA Cultural de Brasília, Brazil from Sept. 18 to Nov. 17. 08/05/13 - Come visit Dini Karasik's wonderful Blog, On Writers & Writing, where I recently had the pleasure to participate for an artist interview entitled, The Connection Between Art & Words. 07/06/13 - A NEW Limited Edition Giclee Art Print is now available in the John Parra Art Store. The 24” x 30” print is entitled, Frida. It was created in honor of Mexican artist Frida Kahlo, one of the most important 20th century painters and wife of famed muralist Diego Rivera. Each print is signed and numbered and comes with a certificate of authenticity. Click here more info: John Parra Art Print. 6/29/13 - Great News! As a contributing illustrator to the book, When Thunder Comes: Poems for Civil Rights Leaders, written by J. Patrick Lewis, I am happy to announce that it will be available today, Saturday, June 29th on the Kindle for only $1.99 through Amazon’s Kindle Daily Deal. 6/5/13 - I would like to say thank you to Professor Robin Fogle Kurz PhD and her students at LSU for inviting me to speak and discuss my work, via Skype, today at her Illustrator as Storyteller graduate class. 5/15/13 - I will be participating the 19th Annual Children's Book Art Silent Auction at BookExpo America (BEA) being held here in NYC by donating an original art illustration from my children’s book, Round is a Tortilla. Proceeds raised from the various donated children’s book artwork will go to support the American Booksellers Foundation for Free Expression (ABFFE) to fight book censorship and support the free speech rights of young readers. 4/26/13 - Paint Me A Story, is a group exhibition I will be participating in, of original art of Latino themed children's books taking place at the Broad Rock Library and Richmond Public Library in Virginia. The show is part of the Dia de los Libros/Ninos celebration. The show will include other great artwork illustration from Joe Cepeda and Lila Weaver, and the opening night reception will include a special introduction by wonderful young adult author Meg Medina on Friday, April 26th from 4 to 6pm. 3/19/13 - I'm happy to announce my new children's book, Round is a Tortilla, is now available in stores and online. The book has already received a Star Award from School Library Journal and other wonderful reviews from Kirkus, Roundtable Reviews, Imagination Soup, and Readertotz. 3/15/13 - Today I was honored with a wonderful photo of civil rights activist, Sylvia Mendez, holding my original artwork of her portrait, seen in the children's book, When Thunder Comes: Poems for Civil Rights Leaders. To learn more about Sylvia and her important, historical and amazing life click here. 12/26/12 - When Thunder Comes, a wonderful new children's poetry book project I worked on, written in moving verse by Children’s Poet Laureate, J. Patrick Lewis, is now available for purchase. The artwork for the book was a collaborative effort split between four other artists and myself. The book profiles seventeen civil rights luminaries from around the world, each represented in portraits, showcasing their struggle and dedication to justice, peace, and tolerance. Read the book's Starred Review from Booklist, a very nice review in Kirkus, and another Starred Review from Publishers Weekly, too! 12/12/12 - Check out all the updates on JohnParraArt.com: new illustration artwork, expanded store with books, prints, and original art, old/new updated postcards and more. 12/01/12 - Waiting for the Biblioburro is now available in Japanese! You can view on Amazon.co.jp. 11/19/12 - Something to be thankful for: Mamiverse has a very nice review for my book Gracias / Thanks as well as one from La Bloga. 11/15/12 - Gracias/Thanks has now been released as an Audiobook on Lorito Books. This recording brings together the voice talents of Rosi Amador with music by Brian Amador and author notes narrated by Pat Mora. See Brian Amador composing and preforming original music for the audio recording of Gracias/Thanks here. 11/07/12 - Hola mi Amigos! I had a wonderful time participating in a mini interview with Juana Martinez-Neal's terrific children's book illustration and writer's blog. Juana herself is a wonderful artist and illustrator as you can see here. For more author and illustrator interviews see the her complete blog. Enjoy! 10/29/12 - Check out some awesome Latino and Latina authors and illustrators on the Wall of Fame at La Casa Azul Bookstore / Pinterest. 10/10/12 - I recently had the pleasure to create the poster for the 10th Anniversary of PaperTigers.org. My goal for the image was to capture the many important and wonderful aspects that PaperTigers stands for as well as honor and celebrate its ten-year milestone. For more info read my interview with PaperTigers here. 09/23/12 - Come out to the Brooklyn Book Festival, this Sunday at 2:30pm in downtown Brooklyn, where I will be reading and signing books of Waiting for the Biblioburro at the Target: Children’s Area and at the Las Comadres/La Casa Azul Bookstore. 09/23/12 - The Brooklyn Book Festival is the largest free literary event in New York City, presenting an array of national and international literary stars and emerging authors. One of America’s premier book festivals, this hip, smart diverse gathering attracts thousands of book lovers of all ages to enjoy authors and the festival’s lively literary marketplace. 09/22/12 - John Parra: Storytelling & Book Signing Saturday 12 - 1pm @ La Casa Azul Bookstore, 143 East 103rd St. NYC: Take a journey with artist John Parra as he shares his creative process and reads and from his select children’s books including: Gracias/Thanks, Waiting for the Biblioburro, P is for Piñata, and My Name is Gabriela. 08/11/12 - Come celebrate at La Casa Azul Bookstore in NYC for my show: Infinitas Gracias - Original Children's Book Art by John Parra, with artist reception & book signing, Saturday August 11, 5-7pm. I will be exhibiting over 20 original artwork illustrations from my award winning children's books, including original art from: Gracias/Thanks, Waiting for the Biblioburro, P is for Piñata, and My Name is Gabriela. Looking forward to seeing you there! 05/24/12 - My children's book, Waiting for the Biblioburro, with author Monica Brown, has been selected to receive The 2012 Christopher Award in the "Books for Young People" category at the 63rd annual Christopher Awards ceremony in New York City this spring. Since 1949, the Christopher Awards have annually saluted media (TV programming, feature films, books for adults and children) that "affirm the highest values of the human spirit." Their goal is to encourage artists to pursue excellence in creative arenas that have the potential to influence large audiences in a positive way. 03/28/12 - We welcome you to the National Latino Children's Literature Conference at the historic University of Alabama campus on March 29 - 30, 2012. The conference will be this Thursday and Friday all day with a special event at the Tuscaloosa Public Library on the evening of March 29th. Monica Brown and myself will present a joint keynote address titled: "Había Una Vez/Once Upon a Time: the Collaborative Vision and Journey between Author and Artist." Other confirmed award winning Latino author and illustrator speakers will be: Joe Cepeda, René Colato Laínez, Meg Medina, F. Isabel Campoy, Alma Flor Ada. 3/15/12 - In Gracias/Thanks related news, Pat Mora and myself both contributed background stories to Judy Bradbury's, The Read-Aloud Scaffold: Best Books to Enhance Content Area Curriculum, Grades Pre-K-3, about our experiences and thoughts creating our book Gracias/Thanks. 03/24/12 - Hola mis amigos y familia! Hello my friends and family! If you find yourself in Brazil at the end of the month I am participating in the 1st Annual (MACLI) Exhibit of Contemporary Art in Children’s Literature / Mostra de Arte Contemporânea em Literatura Infantil, taking place at Livre Galeria, in Rio de Janeiro, from March 24 through May 27. This annual event of children's book art will be showcasing the talents of a select group of international and contemporary artists whose work has been inspired and published in the field of children’s literature. For more art and info click here. 03/01/12 - My children's book Gracias/Thanks with Pat Mora, has received the Gelett Burgess Book of the Year Award. The award honors the best family-friendly children's books inspiring imagination and creativity. The Gelett Burgess Children's Book Awards advisory council looks for books that entertain and teach with an energetic and creative approach. The books the Center selects must stimulate the child's imagination, as well as inspire them creatively. Advisory council members want to know a book will make an impact in a child's life by helping them grow: socially, emotionally, ethically, intellectually, and physically. 02/15/12 - The SCBWI - Golden Kite Awards Poster, is now available free to public libraries and independent bookstores and to current SCBWI members for $10 . Click here for more info. 02/01/12 - Ofrendas del Corazón are holding their Fifth Annual Silent Heart Art Auction Friday, Feb. 10, 2012, from 6 to 9pm, at the Salinas Civic Center, in Pharr, TX. Included among the many artist's donated decorated hearts you can bid on a new painting of mine entitled: St. Valentine Comes by Night, created especially for this wonderful event. The auction goes to benefit The Michael M. Rutledge Legacy Award, a scholarship fund to support dual language students from PSJA High School and PSJA North High School. For those not able to attend the Ofrendas del Corazón Silent Heart Auction in person you can support this wonderful cause by ordering their book: Ofrendas del Corazón (2008-2012). This book beautifully showcases a retrospective of current and past year’s artist participants and their decorated hearts. 01/01/12 - The National Education Association (NEA) posted its annual Read Across America Literacy Calendar featuring, for the month of December, artwork from my book Waiting for the Biblioburro. You can download other months that profile many wonderful children’s books from such luminaries as Roald Dahl, Lulu DeLacre, Leo and Diane Dillon, and many more, along with great media tools and tips for promoting literacy and reading. To download other months from the calendar click here. 10/21/11 - Every Poster Has a Story: The Scoop on the First-Ever Golden Kite Awards Poster. SCBWI recently unveiled its first ever poster featuring winners of the organization's coveted annual Golden Kite Awards. The debut poster was beautifully illustrated by John Parra, 2010 Golden Kite winner for picture book illustration. 10/10/11 - Waiting for the Biblioburro / La Bibli des deux ânes, is now available in French! You can view at Amazon.com / Canada. Some French profile reviews of the book can be seen at: La Courte Echelle, Le Télégramme, Ricochet-Jeunes, Opalivres, and News Book. 09/15/11 - I would like to announce that my first Limited Edition Art Print is now available for purchase on my website. The 24” x 30” giclee print is entitled, El Crucero de Almas / The Crossing of Souls. It was created in the beautiful tradition of the Mexican, Dia de los Muertos / Day of the Dead celebration. Each print is signed and numbered and comes with a certificate of authenticity. Click here more info: John Parra Art Print. 08/09/11 - Waiting for the Biblioburro is now in stores! Be sure to also look for and watch, Biblioburro: The Donkey Library on PBS.org in their POV (Point of View) documentary episode section. There is an opportunity for the first 30 librarians that sign up to host a community screening of the episode to receive a copy of Waiting for Biblioburro for their branch as well! Click here for more info. 08/07/11 - Look for the Unveiling the Golden Kite poster that I recently did to premier at The 40th Anniversary SCBWI Summer Conference that took place in Los Angeles. 08/01/11 - Welcome! ¡Bienvenidos! to the updated Art and Illustration of John Parra website. Make sure to see the expanded gallery, new artist visit section, and store where you will find links to my children's books, art prints, and original art for sale. Enjoy and explore the sights. 07/04/11 - My upcoming children's book, Waiting for the Biblioburro, was profiled on the Cultura / Telesur TV. Learn more about the real life Biblioburro, Luis Sorriano, on PBS POV, CNN Heroes and at The Biblioburro Foundation. 07/04/11 - You can see Waiting for the Biblioburro's book reviews at: School Library Journal, Kirkus Reviews, Publishers Weekly, The Horn Books, The Daily Republic, The Plain Dealer / Cleveland.com, The Happy Nappy Bookseller, She is Too Fond of Book, Sommer Reading, GoodReads, Kids' Brain, Booklist, Full Circle Literary, and PaperTigers. 05/01/11 - I recently contributed a guest blog for Rasco from RIF, speaking about this years April 30 Children's Day/Book Day as well as a profile on my new book coming out in July. 04/06/11 - The de Grummond Art Center and Literature Collection, in Hattiesburg, Mississippi will be hosting the Golden Kite, Golden Dreams Art Show Exhibition, which will include original art from my children’s book Gracias/Thanks. 03/10/11 - FESTIBA has chosen Gracias/Thanks as this year's bilingual book to showcase and distribute at its annual conference and arts festival and at local area schools. For more info visit their website at FESTIBA 2011. See photos of the event on flickr.com. 01/25/11 - Look for my artwork on Bill Frisell’s and Vinicius Cantuária’s wonderful new jazz duet cd Lagrimas Mexicans out now on Entertainment One Music. 12/25/10 - Connect to John Parra Art and Illustration on Facebook for more news and events. 12/18/10 - Work-to-Date web blog has a new professional profile interview on my art and illustration work. There are also many great interviews and images from designers, photographers and other contributing artists. 12/15/10 - 3x3 Magazine included the piece El Crucero de Almas to be part of its 3x3 Illustration Annual No. 7. The annual’s images are selected by a jury, reviewing from the best illustration work from around the world. 11/25/10 - I recently spoke with Kids Growing Libraries web blog for an artist profile and book review. This is a great website, created by Santiago López. The site interviews children’s book writers and artists, while also raising awareness for collecting children’s books that will be donated to local school libraries. 10/19/10 - P is for Piñata, A Mexico Alphabet, received the Eureka! Children's Book Award for Excellence in Non-Fiction from the California Reading Association (CRA). 10/16/10 -The Joslyn Art Museum in Omaha, Nebraska will be hosting the Golden Kite, Golden Dreams Art Show Exhibition, which will include original art from my children’s book Gracias/Thanks. 07/28/10 – This weekend is the SCBWI’s 39th Annual Summer Conference in Los Angeles, CA. I look forward to attending and presenting my workshop as well as meeting all the participants at this year’s event. 07/08/10 - The National Center for Children’s Illustrated Literature (NCCIL) in Abilene, Texas will begin showing, The Golden Kite, Golden Dreams Art Show and Exhibition. The show is a retrospective of SCBWI, Golden Kite Medal and Honor Award Winners, spanning from 1974 to 2010, organized by artist David Diaz. Original art from my children’s book Gracias/Thanks will be included. 06/25/10 - I will be in Washington, DC, this weekend at the Convention Center for the American Library Association’s (ALA) annual conference. Feel free to stop by the Lee and Low Book’s booth for my book signing Saturday. Then join us on Sunday, from 1 to 4pm, at the Renaissance Mayflower Hotel for the Pura Belpré Awards ceremony and book signing. 06/20/10 - Look for my art in CarneMag Issue #4! 05/28/10 – Today is Literacy Day for NYC schools. I will be visiting and speaking about my art, cultural background, and of course children’s books with the students at Elementary School PS-71 in Queens, NY. 05/01/10 - Communication Arts Magazine has included my illustration, El Crucero de Almas, for its 51s Illustration Art Annual. 03/06/10 - Gracias/Thanks was presented with a “Choices” Award from the Cooperative Children’s Book Center (CCBC). 03/02/10 - Gracias/Thanks has won the 2010 Golden Kite Award for Picture Book Illustration from the Society of Children’s Book Writers and Illustrators (SCBWI). 01/18/10 - Gracias/Thanks has won the 2010 Pura Belpré Honors Award for Illustration as well as receiving the Notable Children’s Book Award, from the American Library Association (ALA) and REFORMA. 01/01/10 - Gracias/Thanks was selected for The 2x2 Reading List by The Texas Library Association. 11/29/09 - Gracias/Thanks children’s book received two Starred Reviews from Kirkus and Booklist, as well as made The Long List from Barnes & Noble. 11/05/09 - You can view my artist interview at Bookjoy, a wonderful site promoting literacy and a love of books for all. 11/01/09 - My new children’s book Gracias/Thanks with author Pat Mora is now available in stores. 10/31/09 - Thank you to the Indianapolis Art Center and everyone who came out to the Dia de los Muertos festival and art show that took place this last weekend of October. It was great fun to be the featured visiting artist and showcasing over 30 of my original paintings. We had cool art workshops and lectures with local schools and individuals, plus we had delicious Mexican food, wonderful Latin folk music and beautiful Folklórico dance presentations. 10/15/09 - This week I sat down with Sharon Gamble, at WFYI National Public Radio (NPR) in Indianapolis for her show Art of the Matter, to discuss my background, artwork, and upcoming, El Crucero de Almas, art exhibition at this year’s, Indianapolis Art Center’s, Dia de los Muertos festival and event. 07/01/09 - P is for Piñata, A Mexico Alphabet received the 2008 Pennsylvania School Librarian’s Association’s YA Top Forty Non-Fiction Titles Award. 10/01/08 - My new Children’s book, P is for Piñata a Mexico Alphabet, with author Tony Johnston, is now available in stores. See the blog critic’s review for a profile on the book. 07/14/08 -Visit the Salmagundi Center for American Art in NYC where I will be participating in its Annual Artist's Show. 05/01/07 - Check out Mpls/St. Paul Magazine’s, Raising Reader’s Edition, for my illustration cover and artist profile inside. 10/21/06 - NY Society of Illustrators will host its annual Children’s Book Award Show. Original artwork from My Name is / Me Llamo Gabriela will be on display. 07/14/06 - This Friday I invite you to the Salmagundi Art Center in NYC for a group artist show that I am participating in. 05/25/06 - My Name is / Me llamo Gabriela,has received the award for Best interior Illustrations from Latino Literacy Now at this year’s International Latino book Awards and BookExpo America (BEA), recently held in Washington, DC. 10/01/05 - Stop by Gallery33 East in Long Beach, CA to see new paintings for my show, Exhibición de los Encantos. 09/25/05 - My new children’s book, My Name is Gabriela, with author Monica Brown, is now out in stores. 10/01/04 - Look for the new United Airlines travel destination poster to Mexico that I recently completed. You can find the poster now available at the United Airlines online shop (sold out) or on ebay. 10/02/03 - Spend time at Esthesia Gallery in NYC this week for my, Pinturas y Pasajes, art show. I will have many new paintings on display. 09/01/02 - Thank You to San Diego’s Ranch & Coast Magazine for their wonderful profile on my art and background. 06/01/02 - New paintings at Niagara Gallery in the East Village, NYC for a group art exhibition entitled, The Ignite Show. 04/04/02 - Visit Esthesia Gallery in NYC. I am participating with new work in a great group art collection of paintings and photography entitled, The Paella Show. 12/01/01 - A collection of my original paintings will be on view for, The Tree of Life Show, located at Saatchi and Saatchi, Art Space Offices in New York. 10/29/01 - Stop by Palomar College Gallery in San Marcos, CA, to see my, Dia de los Muertos cross paintings, now on display. 08/05/00 - Explore Wake Me When I’m Famous Gallery in Westwood, Los Angeles for the group art show, No Springs, Honest Weight. I will be participating with original artwork. 04/21/00 - One of my original paintings, Spiritualist, will be used as the cd single cover for the song Judith, by A Perfect Circle. 03/02/00 - Visit La Luz de Jesus Gallery in Hollywood for the annual Uncommercial Art by Commercial Artists Show. I will be returning this year with some new original art on display. 08/01/99 - The website work on Filmcore.com received the Annual Award Recipient for Excellence in Interactive Internet Design from Print Magazine and The Art Directors of New York. 04/01/99 - My original illustration, El Arte Que Nos Mueve / Art That Moves Us, created for Jeep vehicles to promote Hispanic culture and history, will be on display at the Airport Art Spaces of New York, NY and San Antonio, TX. 03/04/99 – Stop by La Luz de Jesus Gallery in Hollywood tonight for their amazing annual Uncommercial Art by Commercial Artist Show. I will have new original paintings shown. 09/03/98 - Visit Delirium-Tremens Gallery in Echo Park, Los Angeles, for a group art show with new paintings on display. 04/14/98 - I will be in New York City this week to receive the Top Student Award Scholarship from NY Society of Illustrators, as well as participate in their Annual Awards Gallery Show. 01/01/98 - Visit, Filmcore.com, a post production commercial film studio site, to see my illustrations interwoven and animated throughout the company’s freak-show circus style website. 12/13/97 - The Art and Illustration of John Parra Art begins!